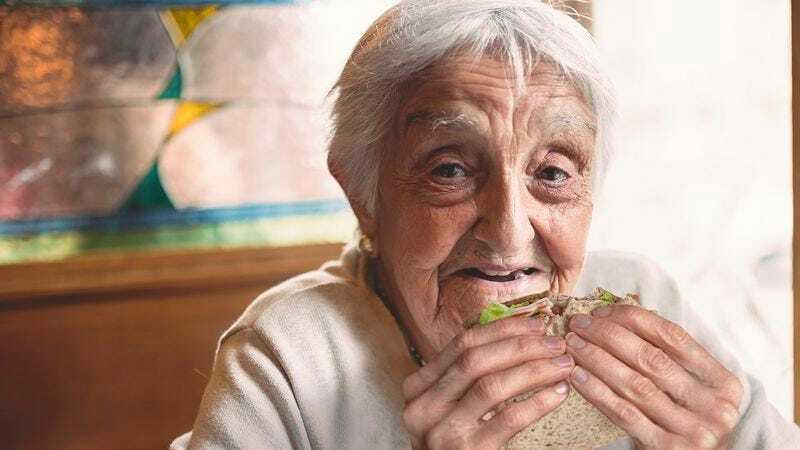 SPOKANE, WA—Claiming they had never seen anything like it before, the stunned family of local grandmother Doreen Weiss reportedly watched in disbelief Wednesday as she wolfed down a sandwich in 33 minutes. “Man, she just stuffed her face and absolutely annihilated that thing,” said Weiss’s grandson Justin, noting that the family couldn’t believe that their grandmother had “inhaled” her chicken salad on rye in just over a half hour. “I wasn’t even halfway through my club sandwich, and she was already completely done with her first bite. It was nuts. She even scarfed down a couple of crackers.” Justin Weiss went on to say that the family was floored when the 86-year-old “pretty much guzzled” two entire spoonfuls of the tomato soup that came with the sandwich before deciding she would save the rest for lunch and dinner tomorrow.